The most hardware packed Android Wear smartwatch on the market with GPS to offer competition even to sportswatches but the design may not suit some tastes. The latest Android Wear watch to enter the race for your wrist is the Sony SmartWatch 3. As a company in the wearables game since the outset, experience shows in this third generation device. But after previous so-so attempts is it finally a case of third time's a charm? The specs of the SmartWatch 3 would suggest so. By adding GPS the Sony is the only smartwatch available right now capable of utilising this recent Android Wear support addition. That coupled with storage for music and an ability to link to Bluetooth headphones makes it a standalone sportswatch too. But it doesn't lose sight of its primary purpose: as a helpful extension of your smartphone to deliver alerts and messages the Sony has all the Android Wear smarts of its near competitors. So is the SmartWatch 3 finally the one we've been waiting for, the do-it-all wearable to replace both a watch and separate sportswatch? We delve deep to find out. We have to kick off by detailing the GPS, since that's the feature Sony has beaten its competitors to the punch by implementing first. Well, in this category anyway, as plenty of sportswatch manufacturers include GPS tracking as a key feature. But in its Android Wear guise the potential is there, but the accompanying software lacks. At the time of writing no big-name running apps take advantage of the Android Wear GPS function – so there's no Endomondo, no Run Keeper and no Runtastic. At the moment we've only found Google's MyTracks is compatible. Using this the app located the GPS signal fast, beating a TomTom Multi-Sport Cardio sportswatch to the punch when tested in tandem. But that speed may have been at the cost of accuracy, as the TomTom measured a 1.09km distance compared to a 1.2km measure using the SmartWatch 3. For this comparison we were running through some wooded areas that may have affected coverage, and otherwise haven't found the Sony to be too far from accurate. However, one of the concerns regarding GPS is just how much it munches through battery life. With GPS active and while listening to music the SmartWatch 3, in one example, dipped from a 27 per cent battery charge down to 15 per cent after just over 12 minutes of use. That's one per cent per minute – quite a lot, but still enough to last for over an hour and a half of non-stop running while listening to tunes. A dedicated sportswatch would likely sustain five hours of non-stop GPS use, albeit without the notifications and Bluetooth-based music delivery. On balance the SmartWatch 3 achieves a good enough battery life, particularly as you can train and listen to music all without needing a synched phone. In this way the Sony SmartWatch is a real threat to current GPS sportswatches that are largely unable to offer a complete package for a run without an accompanying device for music. The Sony SmartWatch 3 is slim, there's no denying that. The centre module protrudes 10mm from the wrist, but it's also a rather basic module and strap combination to look at. The main unit can be removed from its strap, presumably for carrying in a pocket or bag, but this compromise on commitment to making it solely a watch has cost the design. It's not as aesthetically appealing as the Asus ZenWatch for example. The edging of the SmartWatch 3 is obvious between the glass face and the rubberised strap housing. Ultimately it looks cheap, not like a £190 watch. Also the control button on the side of the watch has no feedback, so no click or even movement as you press it. However, the clasp on the strap is excellent and finished in chrome effect with Sony branding. It's just a shame the rest of the watch isn't as well finished. That said this SmartWatch 3 is clearly aimed at the more sporty type who will want to use the GPS tracking, so the rubberised strap is ideal. The slim build and plethora of functions has been given precedence over aesthetics; Sony's tactic is to go for features, unlike Apple and its impending design-focused Watch. The Sony SmartWatch 2 may have been more attractive in its square design format – it's a little thicker and looks more like a watch than the SmartWatch 3's sports band appearance - but it lacked the full-on feature set. That's where the SmartWatch 3 succeeds for the price tag, while offering a fuller experience than a product such as Sony's own SmartBand Talk. The centrepiece of the SmartWatch 3 is its 1.6-inch 320x320 TFT LCD screen. It's perfectly clear to view straight on, even in daylight thanks to reactive auto-brightness adjustment, and despite a resolution that doesn't sound jaw-dropping, it's as pixel-packed as these things get right now. As is to be expected from Sony the colours are clear and vibrant and the display refreshes more than fast enough to even play video. The main gripe we have is the whites aren't as brilliant as other smartwatches we've seen. The Sony has a certain yellowish hue to its screen, as if it's trying to save on power, but you get used to it quickly enough. Watch faces are also lacking, but there are always more you can download from third parties. One thing we notice about the stock faces is that lots are white, which will chew through battery life. So if you're looking for a classy watch face and want to save battery you'll have to shop around on the Android Wear store. A unique attribute of the SmartWatch 3 is its ability to charge via microUSB – just as your Android phone does. This is brilliant as you don't have to worry about ever losing a specific housing adapter typical of many other wearables. And since the on board battery is a small 420mAh it's fully charged again in about an hour, leaving you plenty of time to charge your phone. For a wearable so slim the battery in the SmartWatch 3 manages an impressive life per charge in normal use. Without using the built-in GPS the result is a good day and a half to two days of use which even competes with the chunky LG G Watch R which impressed us for battery life performance. With GPS put to constant use, however, the battery is chewed through in as many hours rather than days. All Android Wear watches are limited or enhanced by the operating system, depending on how you look at it. While the OS is visually clean, gets regular updates and has an ever-growing app store, it can also be limited in terms of compatibility and operation. For the full lowdown on Android Wear's capabilities, check out our in-depth software review below. Otherwise here's the skinny: Android Wear relies on either voice input to access apps, which often only works for very specific commands, or by drilling down into a menu to find the relevant app. Also apps aren't always up to date – the lack of GPS support in major running apps, as we highlighted earlier, being just one example. But on the plus side you know that this platform is always going to continue to grow and improve. The GPS support and local music storage were recently added, for example, which immediately makes Android Wear watches a bigger threat to GPS watches – while adding value to the hardware anyone has already bought. One great example of this was a Christmas lunch we went on at the end of 2014. We were given a selfie stick as a present and immediately realised the watch could act as a shutter button allowing us to take photos from far away without being limited by a timer. It didn't even require an app download, a camera shutter button popped up on the watch automatically when we went to take a selfie. It's this kind of seamless "just-works" offering that Android Wear is working towards perfecting and we're getting more and more glimpses of the full potential. The Sony SmartWatch 3 manages to improve the feature set compared to its predecessor thanks to built-in GPS. But it still falls short in a some areas, making that smartwatch purchase decision less clear cut than the high-flying Sony specification may suggest. Our main qualm is the overall look of the SmartWatch 3. It seems to have almost taken a step back on the design front, while other competitors march forward. It just doesn't look like a quality wearable, which is what many people are pining for in this market. With the LG G Watch R delivering a more premium built (albeit a thicker one) and the Asus ZenWatch lending itself to a more classic appearance, the Sony isn't top of the stack when it comes to looks. But it could be argued that the SmartWatch 3 is aimed more at the sporty type, given the GPS integration for tracking activity independent of a synched phone. However, with battery life that can't rival dedicated sportswatches with GPS activated, a lack of heart-rate monitor, and not a great deal of Android Wear app compatibility it also finds itself neither here nor there. On balance the SmatWatch 3 is just as successful for the usual smartphone-based notifications at a glance as its competitors. Standard use sees the battery life last out well too, delivering near to two days per charge and rivalling the LG G Watch R in a slimmer form factor. With 2015 set to be the year when wearables will come to the boil, and all eyes looking to the Apple Watch to fuel the market, it's Sony that offers some of the most desirable features. 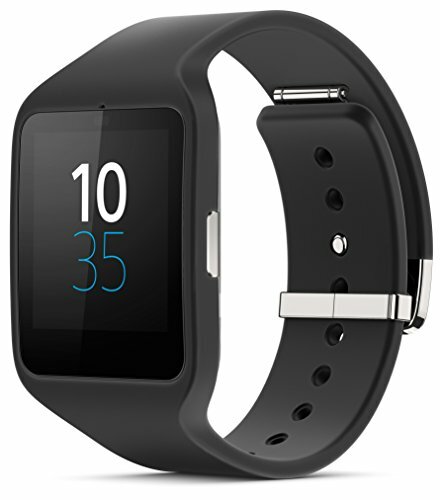 If it's a smart sportswatch you're looking for then nothing compares to the Sony SmartWatch 3. We just wish it was more premium in finish.